What are the risk factors for osteoarthritis?What are the symptoms of osteoarthritis?How is osteoarthritis diagnosed?What are the treatments for osteoarthritis?Are there screening tests for osteoarthritis?How can I reduce my risk of osteoarthritis?What questions should I ask my doctor?What is it like to live with osteoarthritis?Where can I get more information about osteoarthritis? 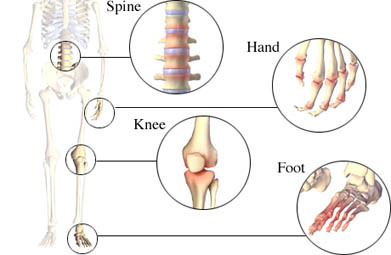 Osteoarthritis (OA) of the knee. EBSCO DynaMed Plus website. Available at: http://www.dynamed.com/topics/dmp~AN~T116897/Osteoarthritis-OA-of-the-knee. Updated March 15, 2018. Accessed May 30, 2018. Osteoarthritis (OA) of the hip. EBSCO DynaMed Plus website. Available at: http://www.dynamed.com/topics/dmp~AN~T114846/Osteoarthritis-OA-of-the-hip. Updated March 15, 2018. Accessed May 30, 2018. Osteoarthritis. National Institute of Arthritis and Musculoskeletal and Skin Diseases website. Available at: http://www.niams.nih.gov/Health%5FInfo/Osteoarthritis/default.asp. Updated May 30, 2016. Accessed May 30, 2018.